The Healthy Community Lab at the University of British Columbia is releasing a new report today in partnership with Healthy Canada by Design entitled, Residential Preferences and Public Health in Metro Vancouver: Promoting Health and Well Being by Meeting the Demand for Walkable Urban Environments. Funded by the Real Estate Foundation of BC, and led by Dr. Larry Frank, the report summarizes findings from a residential preferences survey that was conducted with funding provided by Health Canada through the Canadian Partnership Against Cancer`s Coalitions Linking Action and Science for Prevention (CLASP) program through the HCBD CLASP Initiative. Based on a survey of 1223 residents in Metro Vancouver; 512 from the City of Vancouver and 711 from the Metro Vancouver area that surrounds the City of Vancouver (Outer Metro Vancouver), the study found that residents have a strong preference for walkable neighbourhoods. Nearly two thirds of residents in the City of Vancouver and 40% of residents in Outer Vancouver expressed a strong preference for living within walking distance of shops and services, while only 8% and 20% respectively expressed a strong preference for living in car-oriented neighbourhoods where commercial areas are separated from homes. 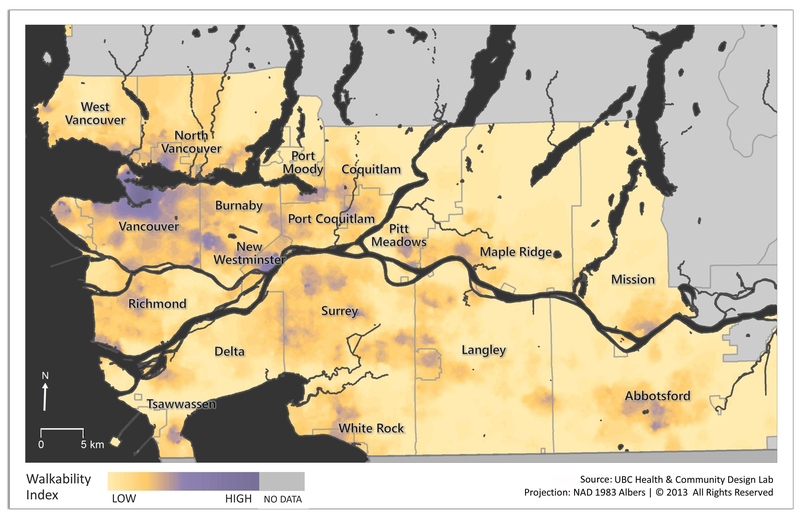 The survey identified an unmet demand for more walkable neighbourhoods among those who live in car-oriented neighbourhoods in both the City of Vancouver and Outer Metro Vancouver. Among those who live in very car-oriented neighbourhoods, 25 to 30% would like to live within walking distance of a variety of grocery stores, specialty food stores, butchers, and 20 to 24% would like to live within walking distance of different types of commercial services. 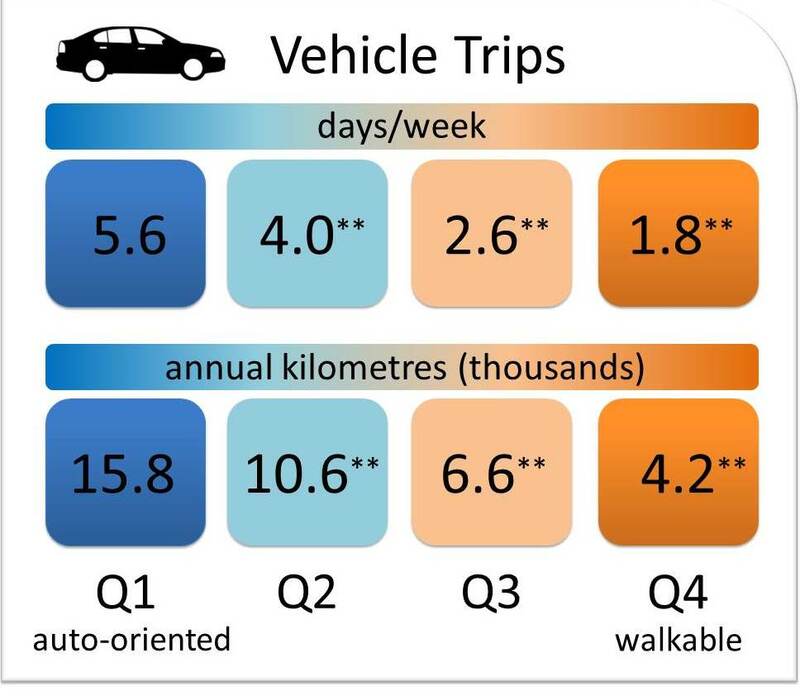 Conversely, among residents who live in walkable neighbourhoods in Metro Vancouver, only 2 to 12% expressed a desire to live in a more car-oriented neighbourhoods. “This study demonstrates that there is an untapped potential to increase walking and physical activity in Metro Vancouver by ensuring that more people have the option to walk, cycle or take public transit to work and school” according to Dr. Helena Swinkels, Medical Health Officer with Fraser Health Authority. 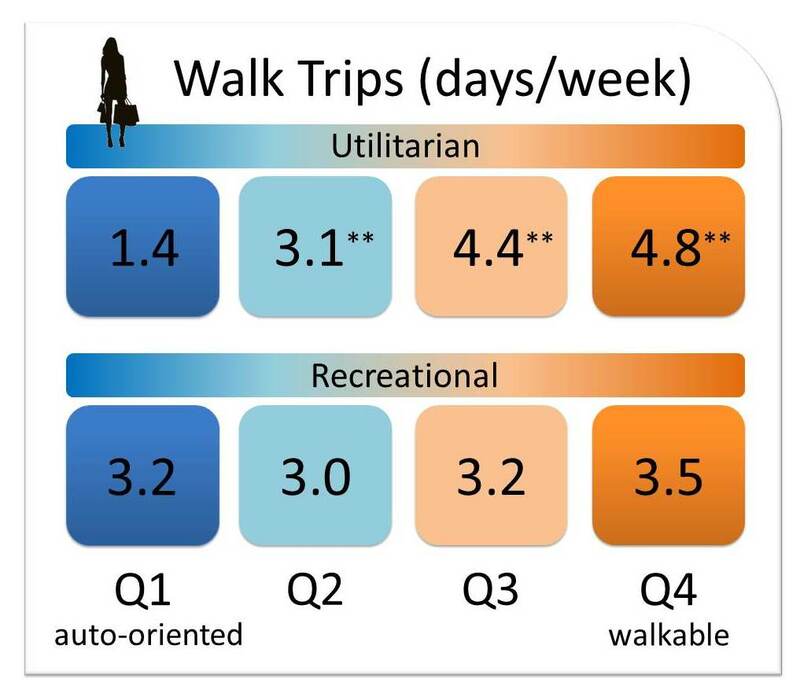 While the study found little variation in the recreational walking patterns among residents who live in the least and most walkable neighbourhoods in Metro Vancouver, it found that residents in the most walkable neighbourhoods walk as a mode of transportation to work, school, and to do errands significantly more often than those who live in the least walkable neighbourhoods. 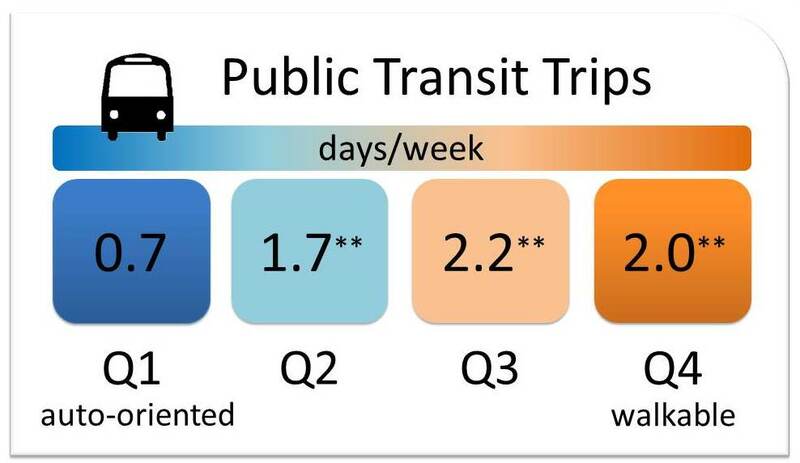 They also use transit much more frequently, drive far less often, and drive far fewer kilometres. “These are impressive findings for those of us who are working to reduce the risk of chronic diseases by encouraging people to be more physically active” offered Dr. John Carsley, Medical Health Officer with Vancouver Coastal Health. The study found that residents who prefer to live in car-oriented neighbourhoods walk significantly more for transportation-based purposes than their counterparts when they live in walkable neighbourhoods, and conversely, residents who prefer to live in walkable neighbourhoods walk significantly less for transportation than their counterparts when they live in car-oriented neighbourhoods. 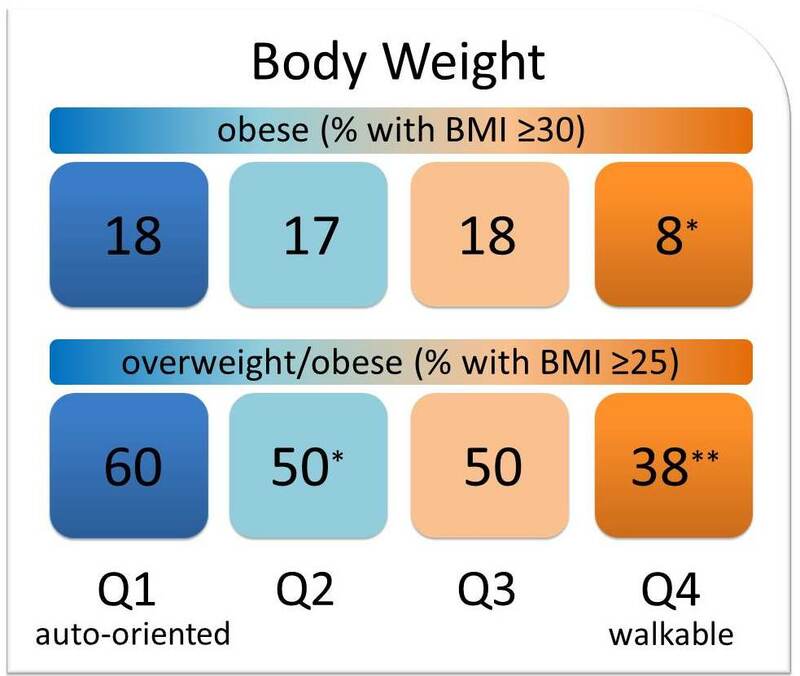 The study also found that residents living in the most walkable neighbourhoods were less likely to be overweight than those living in the least walkable neighbourhoods. They also had significantly lower rates of high blood pressure and lower rates of Diabetes. “These findings tell us that when we align consumer demand with principles of good neighbourhood design, we build healthier communities that benefit everyone” concludes Jack Wong, CEO, the Real Estate Foundation of BC. Reference: Frank, L., S. Kershaw, J. Chapman, K. Perrotta. 2014. 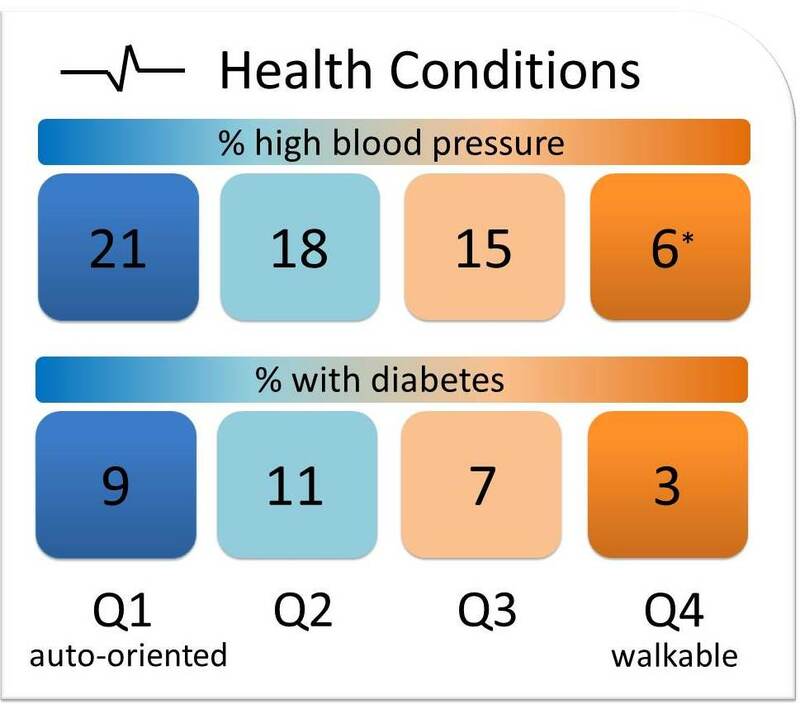 Residential Preferences and Public Health in Metro Vancouver: Promoting Health and Well Being by Meeting the Demand for Walkable Urban Environments. This entry was posted in active transportation, built environment, CLASP, HCBD CLASP, health and land use planning, Healthy Canada by Design, healthy communities, public health and land use planning, sustainability, walkability, walkable comunities and tagged active communities, active living, built environment, chronic disease, CLASP, community design, HCBD, HCBD CLASP, walkability, walkable communities. Bookmark the permalink.